This planking protocol is designed to teach you how to build static and dynamic stability in your spine. 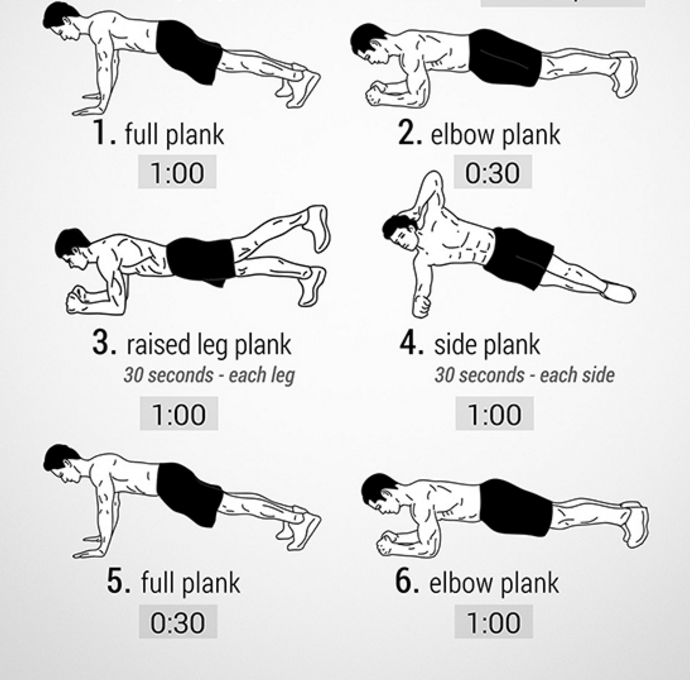 The planking protocol can be incorporated into your weekly strength program. This planking exercise is used consistently in practice. The demonstrated video (see video) have multiple levels that become increasingly difficult as your strength improves. You’ll focus on building a base of static stability and eventually progress to dynamic stability as your strength improves. Plank exercises gives stability to the spine, so it allows you to transfer energi down your limbs (the spinal engine theory) and become more efficient and explosive. A stable spine also plays a large role in injury prevention. I know there also are criticism of the plank exercises especially due to its lack of transfer to more functional activities. Others say it is outright dangerous for lower back if you arching in the lower back. There are pros and cons for everything in life, and I thing it is a great exercise to strengthens your core muscles, which is important to ensure stability of the body in all movements. Starting position by lying on your front, supporting yourself on your forearms and feet. During this exercise, lift your upper body, pelvis and legs up until your body is in a straight line from head to foot. Draw your shoulder blades in towards your spine so that they lie flat against your back. Your elbows are directly under your shoulders. Pull in your stomach and gluteal muscles and hold the position for 20–30 seconds. Return to the starting position, take a short break and repeat the exercise (From FIFA 11+). Your body should be in a straight line from head to feet. Your elbows should be directly under your shoulders. Do not tilt your head backwards. Do not sway or arch your back. Do not raise your buttocks.